1. Heat the oven to 190°C/ Gas 5. 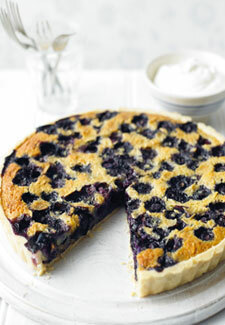 Roll out the pastry and use to line a 27cm loose-bottomed tart tin. Prick the base and line with parchment and baking beans. Bake for 15 mins. Remove the beans and parchment and return to the oven for 5 mins until the pastry is a pale biscuit colour. 2. Melt the butter and sugar in a pan. When the sugar has dissolved, pour the mixture into a bowl and beat in the eggs and almonds. 3. Spread a little jam over the base of the tart case, sprinkle with blueberries and pour the egg mixture carefully over the top. Bake in the oven for 20 mins until the filling is golden, risen and springy to the touch.